Apple has shelved plans to build a new flagship Apple Store at the Federation Square shopping center in Melbourne, Australia after heritage authorities refused an application to demolish the Yarra Building that's already on the site. 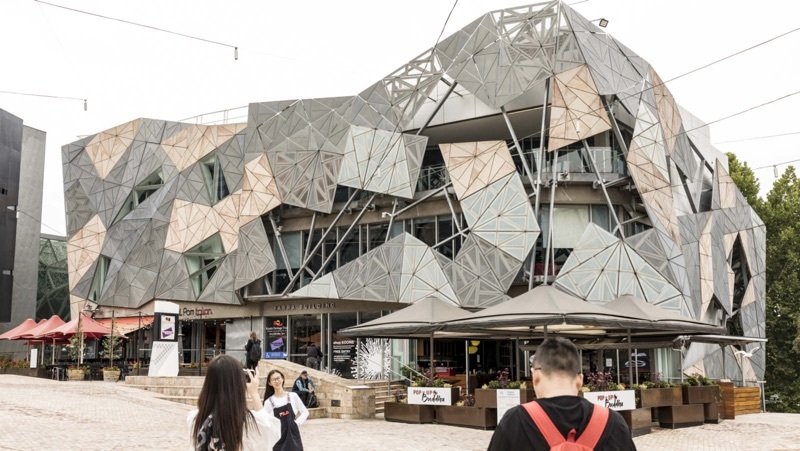 According to The Sydney Morning Herald and The Age Heritage Victoria today said that the Yarra Building could not be torn down as it would result in an "unacceptable and irreversible detrimental impact on the cultural heritage significance of Federation Square." Apple in response said that it would not proceed with plans to build the store. An Apple spokesperson told The Age that Apple was disappointed it would no longer be able to build a retail store at Federation Square. "We remain committed to serving our customers in Melbourne and across Australia," said the spokesperson. Apple first announced plans to build an Apple retail location at Federation Square in December 2017, with the company planning to make it an "Apple Global Flagship Store" that would have been Apple's most significant store in the Southern Hemisphere, offering workshops, classes, and live music events. Apple's plans for the store called for the demolition of the Yarra Building, a move that ultimately received backlash from the Melbourne City Council and Melbourne locals unhappy with the plan to give public space to a corporation. The original Federation Square design featured a pagoda-style building that locals also disliked, referring to it as a "Pizza Hut Pagoda." Apple in July 2018 submitted revised blueprints for the store with an updated design created after workshops with Federation Square management, the Victorian Government, and the Melbourne City Council, but permission was still required to remove the Yarra Building. Federation Square management in December applied to Heritage Victoria for a permit that would allow the Yarra Building to be torn down so Apple could proceed with the building of the store, but that application was denied after heritage authorities received thousands of objections from Melbourne locals. The Yarra Bldg. looks like something Frank Gehry designed after dropping acid. Any aesthetic, even Apple's condescending pseudo-minimalist claptrap, would be an improvement. You must be joking. That building is a hideous eyesore. Especially next to the elegant Flinders Station. If Apple's design is a "Pizza Hut Pagoda" whatever is currently there now is something I call a "cluster****". The store has been AirPower'd. I was all for the new Fed Square Apple Store, simply because it would provide a place to sit and have attractions and amusements. Fed Square as it currently stands is a heat bowl, like a desert in summer and completely boring. An Apple store there would not only attract tourists, have a point of an attraction but also update the architecture which is currently quite ugly to look at, let alone be in. A real shame they couldn’t come to a compromise as I firmly believe that as it stands, Fed Square is not an inviting public space to be in. People just go there because it’s there and there’s nothing else around. Sad. Haha, choosing that Edward scissorhands of a building over a flagship store which would certainly at the very least bring a ton of tax dollars to the city. What a bad call, but their call to make I guess. I’ll never be visiting haha. Regardless of the architectural merits of the buildings, it seems the views of local people were taken into account. I applaud that if nothing else. Plus I can't help feeling it's good for Apple to be told 'no' every now and then. I normally am not impressed by Apple’s designs which look too bland to me a lot of times. And normally on the side of preserving history. But Apple’s store would have replaced something truly ugly and hideous and would have been an improvement. Oh well. Altruistically I’d love to see them build where no one else will—impossible and unloved spaces—and let it become a catalyst for change and improvement in the surrounding area.